Experience the magnificent landscape of Norangsdalen, with stops in both the community of Urke and at the historic Hotel Union Oye. Your day begins with a drive up Orneveien, enjoying magnificent views of the Geirangerfjord. One of the many highlights of this trip are the 11 hairpin turns on the way down the winding Trollstigen pass. Rebuilt after a disastrous fire in 1904, the town was recreated to reflect the Art Nouveau trend of the time. This fascinating guided tour brings the town, its history and the symbolism of its architecture to life. Take a boat trip out to Munkholmen, a part of Trondheim that is full of history. Visit the buildings on the islet, which will take you back 1,000 years. Norway’s second-largest glacier has beguiled visitors for over a century. Board a boat south of Ørnes and sail through the narrow straits, passing small islands and skerries enroute to the Svartisen Tourist Centre. Travel by RIB boats to witness the world’s strongest tidal current, where millions of gallons of water are forced through a 150-mt-wide strait. On the way, we hope to observe sea eagles, Europe’s largest predatory bird. The chieftain and the lady of the house invite you to join a Viking celebration. Experience the magic and excitement as they make sacrifices to the Gods, hoping that the sun will turn to avoid Ragnarok, the end of the world. Visit a recreation of the largest Viking building ever found, an original chieftain house dating from 500 AD. Joining a Viking celebration and learn about the customs and legends of Viking life while enjoying traditional food in an authentic setting. 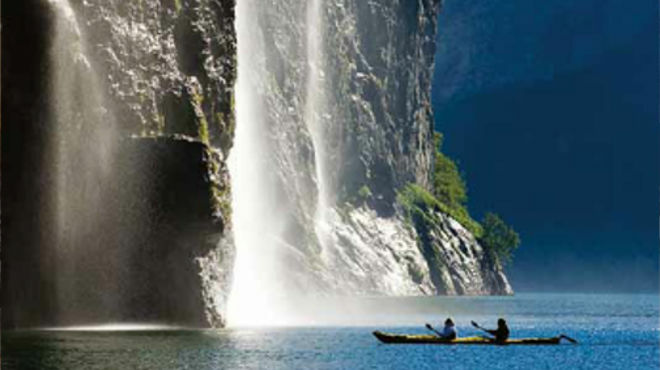 Lyngsfjord Adventure and Camp Tamok offer an extraordinary wilderness experience. It includes reindeer-driving, dog-sledding and a snowmobile safari. Take a miniature polar expedition. Enjoy stunning views of the ocean, mountains and open plateau while huskies pull you across the frozen landscape. Take a guided walking tourof Tromsø, highlighting the town and its vital links with polar exploration. Visit the fascinating Polar Museum and 'Olhallen', Tromso’s oldest pub, and enjoy a beer from the world’s northern-most brewery located across the road. Take to the water near Tromsø with the majestic mountains forming a stunning backdrop. This is a great way to travel silently through these pristine waters and get close to the marine wildlife. Enjoy the magnificent sub-Arctic landscape as you cross the 71st parallel on your journey towards the North Cape, the northern-most point on the continent. Visit the North Cape Hall, where you can see a 180° panoramic film about Finnmark and the North Cape. Travel across Magerøya Island to the tiny fishing village of Gjesvær. Here, you board a boat to Gjesværstappan Nature Reserve, an archipelago that is home to three million nesting birds. A unique opportunity to meet a family of Sámi reindeer herders and experience the rich history and fascinating nature of the area. Experience snow-clad valleys, fresh winter air and perhaps the mesmerising Northern Lights in the clear, starry sky. The Sámi shaman has valuable knowledge about the possibilities nature provided. Learn about nature’s pantry and pharmacy. The Varanger region is one of the most attractive bird-watching areas in the Arctic. Hornøya, Norway’s eastern-most point and a bird sanctuary island off the coast of Vardo, is one of the highlights. The only town in Norway where East meets West. You stop at Storskog, the border station between Norway and Russia. River boats take you up the Pasvikelva, a river with a cultural history dating back thousands of years. See the rich animal and plant life and step ashore at the border between Norway and Russia. Enjoy an invigorating ride by snowmobile across ice-covered fjords and the serene landscapes of Arctic winter. Guides will explain the fascinating history of the indigenous Sámi people and welcome refreshments will be served in the Lavvo. A guided tour of beautifully decorated snow suites is followed by a drink in Norway’s largest ice bar made entirely of snow and ice. After receiving instructions on how to drive a quad bike, you will set off to Kjerringstupet viewpoint and continue to the Norwegian-Russian border. Experience the real wilderness during this exciting ride! If time allows, you could also visit the Snow Hotel or the reindeer enclosure. This excursion will provide you with an insight into the autumn season in the Arctic – how people have harvested, stored, hunted and fished for centuries. Drive through the beautiful Arctic landscape during the polar night. You might see the Northern Lights in a clear, starlit sky. A wonderful tour through impressive scenery to enjoy breakfast at the North Cape followed by a drive through the dramatic Arctic landscape of Finnmark county, before rejoining the ship in Hammerfest. Visit the Meridian Monument, which is on the UNESCO list of World Heritage Sites. Learn about Europe’s first Liquid Natural Gas plant and stop at Mount Salen for a view of the town. As the candle lights flicker, this elegant church is filled with the sound of the most beautiful Norwegian folk songs, as well as some classical and sacred selections. On this trip from Harstad to Sortland, you will experience history, beautiful scenery and a selection of breathtaking sights. One of the highlights is a visit to the Trondenes church. The sheltered bays and glorious mountain landscapes of the Lofoten Islands are home and workplace to generations of fishermen who have learnt to live in harmony with the changing moods of nature. In Henningsvær, visit a gallery which displays art and photographs that capture the very essence of life in these islands. The area surrounding Trollfjord is the realm of the mighty sea eagle. We sail into this narrow fjord, passing through a sound enclosed by steep mountains. Usually a number of sea eagles circle above the boat, giving you a close-up view of these rare and beautiful birds. Take a speed-filled excursion with RIB boats into the fantastic Lofoten archipelago. There is a good chance to look at sea eagles up close. The Vega archipelago consists of 6,000 islands and islets and is a UNESCO World Heritage Site. Visit the ‘E-house’, a museum about eider ducks and the tradition of keeping them as domestic birds. This sightseeing tour of Norway’s third-largest city includes a visit to the famous Nidaros Cathedral, Norway’s largest medieval church and a national shrine since the 11th century. A guided walk through the historical streets of Trondheim, passing the city’s main attractions including the Royal Residence, the old town bridge and the Nidaros Cathedral. It’s 8.2 km long, built across 8 bridges and is surrounded by picturesque landscape. Visit Kvernes Stave Church and eat dinner at a local tavern. Bergen is surrounded by seven imposing mountains. During this trip, you will receive an insight into the city’s history and development, from its founding in 1070, right up to the present day. Only sold on board.